I came across an interesting question on SharePoint StackExchange today. 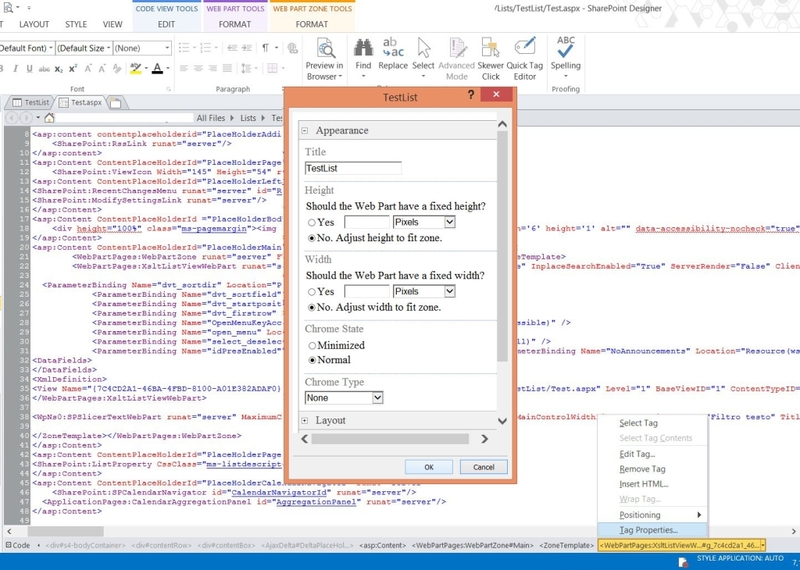 The poster reported an issue with SharePoint Designer 2013 where the List View Tools tab isn't showing up when clicking on a XsltListViewWebPart or anywhere within the webpart code. This is particulary annoying because some of the most useful commands like Filters, Parameters, Sort & Group, not to mention the essential Customize XSLT, are all contained within the List View Tools tab and hand-writing the Xml/Xslt code you get when using the UI is not the funniest thing in the world. I've always thought that SharePoint Designer is one of the most embarrassing crappy piece of software ever written, which caused me countless hours of frustration, but this is a bit too much. They should have dropped it altogether, not just mutilating it by cutting out the designer view. Anyway, enough ranting. Here's a "quick and dirty" workaround to get the beloved List View Tools tab back. Open the XsltListViewWebPart Tag properties (position the mouse over the <WebPartPages:XsltListViewWebPart> tag, right click, then click on Tag Properties or alternatively, on the bottom right of the screen, click on the breadcrumb <WebPartPages:XsltListViewWebPart> part, then click on Tag properties). A popup window will appear. Don't change anything (unless you actually need to) and click on the OK button. Et voilà, The List View Tools tab will immediately show up. Here's the same page, right after having clicked on the OK button. The List View Tools tab is back. You will need to repeat the steps above every time you re-open the page and need to edit the webpart again. 16 comments on "List View Tools tab missing in SharePoint Designer 2013"
This was so annoying. Thanks for the fix!! There is no logic in that.. but it works!! Amazing !! 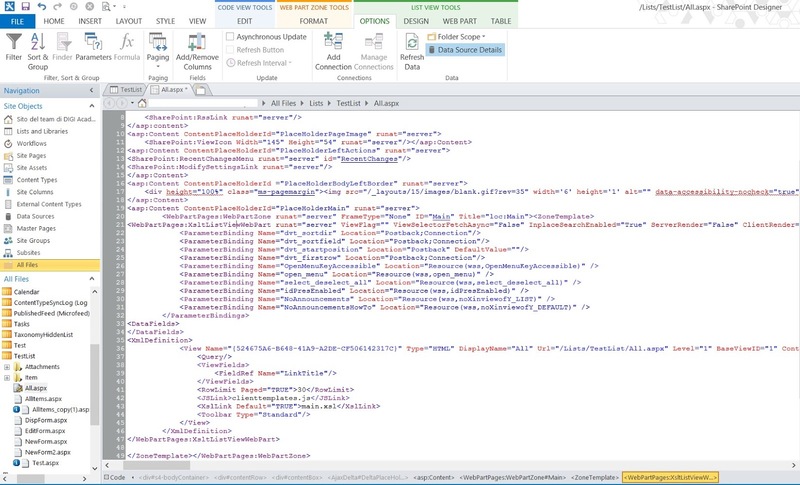 I'm trying to do this on a view on Sharepoint Online but I'm getting Page Properties when I open Tag Properties, also in the breadcrumb I don't get the path. In the tool bar I can see only CodeView Tools. What could be wrong? When I open the view in Advanced Mode I get some alerts that I don't have permission to do this operation etc.I think this could be the reason. I will get back as soon as I try with other permissions. Same here. I'm on premise but none of the contextual tabs are working. I tested from the same workstation on an 0365 instance and it works fine. I'm a site collection admin. Doesn't seem like a whole lot of people have had this issue so its hard for me to pin it down. What gives. For me the problem was the permissions on site collection level, when I was opening the Designer I was getting some alerts. It is all working now. When I click on "Tag Properties", I see "Page Properties" instead and I never see "List View Tools". Any help is appreciated. Did you find a resolution? I get the same thing. Thanks so much for this fix! Shouldn't have to use a work-around, but I'm so glad you posted this! Great trick and it works nicely! You saved my day Matteo. I was pulling my hair off to find a solution for this. Thank you very much!